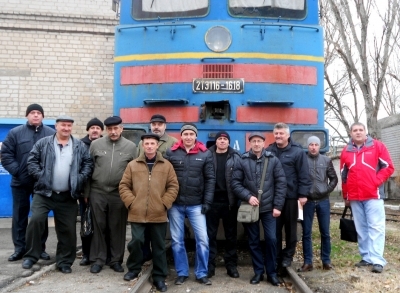 A group of Lviv railway workers visited Melitopol in Zaporizhya oblast. The guests from Western Ukraine shared their working experience with colleagues at the locomotive depot Melitopol Dnieper railway station and workers of Melitopol. They noted that their equipment is more modern that at Dnieper railways. Unfortunately, here the relations between management and workers are the same, and unfortunately not good. inadequate medical treatment, poor nutrition and protective clothing of low quality. Workers of Lviv and Dnieper Railways also shared experience of their trade union activity. The delegation also participated in a meeting of the trade union committee of VPZU Melitopol. Thank you to Volodymyr Sotnyk of VPZU for this report on the delegation of from Lviv who visited Melitopol Zaporozhye region on 24-28 November.